The Government's proposed passenger bill of rights is facing new obstacles in parliament after a Senate Committee examining the bill called for even stronger protection for consumers when they are hit with lengthy tarmac delays at the airport. In December, CBC's Marketplace highlighted that the Government's proposals appeared to be rolling back existing passenger rights. At the time, all major Canadian airlines committed to offer food, water and the right for passengers to disembark the plane after they had been waiting on the tarmac for at least 90 minutes. But Air Canada has since increased their threshold to four hours. Passengers and advocates have been alarmed that the bill proposed rolling back the minimum delay threshold from 90 minutes to three hours. The Canadian Transportation Agency sanctioned Air Transat in November over two flights that had lengthy tarmac delays. The agency found that the airline failed to fulfill its obligation to passengers for food, drink and an opportunity to get off the plane. Passenger advocate Gabor Lukacs' says thousands of Canadians have written to the committee calling for amendments to the bill. He presented evidence to the committee last week and senators agreed to amend the bill and set the threshold at 90 minutes. "We thank Senators for recognising that three hours is too long to be forced to sit in an airplane on the tarmac". Lukacs told the CBC. But the government maintains that three hours is the appropriate length of time before passengers should be offered food, drink and the right to disembark. A spokesperson for Minister of Transport, Marc Garneau — who is sponsoring the bill — says that "giving a three hour opportunity serves the interests of the passenger" as "they don't want off the plane, they want to get to their destination". Although Lukacs welcomes the proposed amendment, he remains concerned that — as Marketplace also reported in December — the bill proposes to relieve airlines of the obligation to compensate passengers for delays caused by maintenance problems. 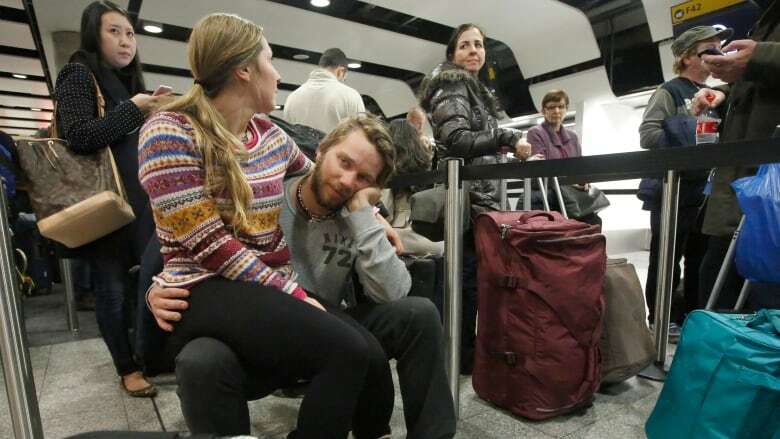 In Europe, widely considered to have the world's strongest air passenger rights, airlines have to compensate passengers for lengthy delays or cancellations that are caused by mechanical issues. "I don't see why it should be any different in Canada", Lukacs told the CBC. "In Europe, airlines are required to provide specific compensation…due to maintenance issues, and yet, they have a healthy and competitive market and profitable airlines". Lukacs also highlighted this to the Senate committee last week, but as of yet no amendments have been forthcoming. Before the bill becomes law it has to pass Third Reading in the Senate — where amendments can be added or removed — before returning to the House of Commons for consideration. "We'll let the legislative process continue its course, and the minister's position is very clear as to what he expected and wanted to see in the bill," Garneau's spokesperson said. Luke Denne is an investigative journalist for Marketplace. Originally from the U.K., he's based in Toronto.